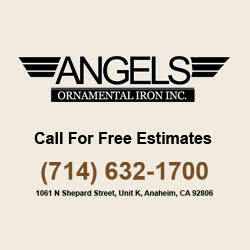 Angels Ornamental Iron - Orange County, CA’s iron fecne, gates & doors contractor since since 1993. Specialize in ornamental wrought iron stair railings & staircases, wine doors, & pedestrian gates. Call us for custom decorative iron guard/handrails, repair, and service work.